The reality of diving is summarised in this rule of thumb. "A diver certified for Open Water is the equivalent to earning one's driver's license. Achieving Advanced in diving means you're clear to head out on the highway. Scuba diving is unlike all other recreational hobbies. It allows us to explore an amazing world that defies the gravity that we're accustomed to and is home to an entirely different realm of species. Such a unique experience can produce a wide array of effects on each of us both mentally and physically. With diving in particular, small problems can lead to much larger safety and health problems when not dealt with properly. Becoming a Rescue Diver helps you to both recognize and respond to these situations as they become apparent. As of today, I am a certified Rescue Diver. Completing this course with TRACC has been one of the most entertaining, frustrating and empowering things I've ever done. 1- Anything can happen at any time. While loading a boat full of divers, Sonny (staff member) managed to impale his eye on the cleat in the front of the boat, blood everywhere. Despite having gone on a leisurely dive, Tom (intern) became an unresponsive diver at 10m underwater. 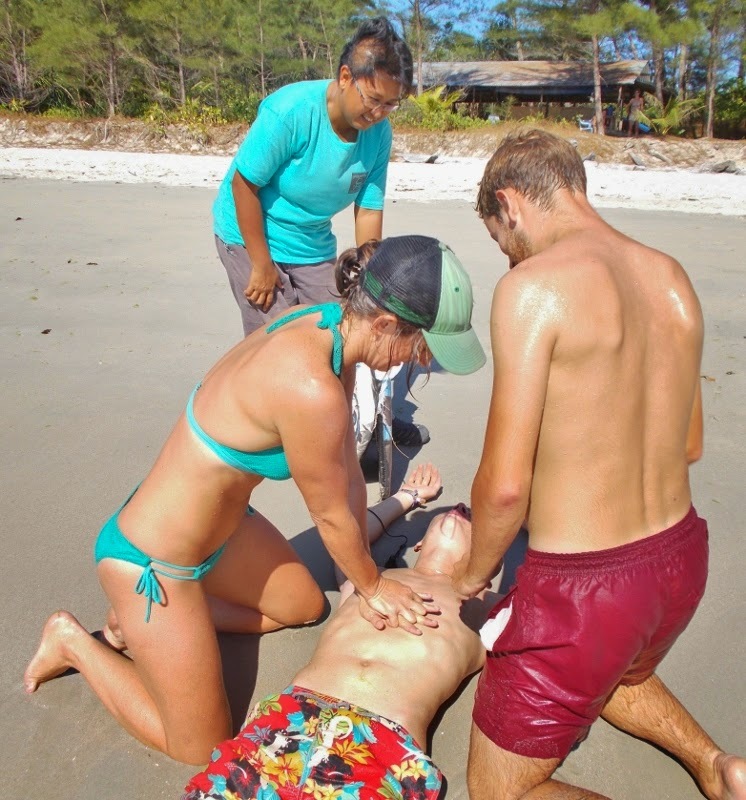 Matteo (volunteer) became a drown victim while on the way to help me rescue Gon (dive instructor). Jason (staff) was found unconscious, not breathing and drifting with the current, away from the boat at the surface after a work dive. There was such an abundance of missing divers that I dare say I'll tie ropes to everyone! In an attempt to help someone as quickly as possible, I often managed to do more harm than good. In one scenario I left so abruptly to fetch an unresponsive swimmer that I neglected to consider how much more quickly I could have brought the victim to shore, had I just grabbed the fins that sat beside me. On another occasion I left the boat (with nothing but fins) to help a unresponsive diver at the surface without having realized that she had already removed her BCD- hence, we had no flotation device. In almost every scenario I encountered, the victim wore a weight belt. In basically all of these scenarios I neglected to remove the belt first. This added drag (in the water) and mass (on land) which inevitably resulted in slowing down the rescue, potentially critically affecting victim survival. For one beach shore rescue the victim I'd dragged out of the water and onto the shore was wearing at least 8 kg on his weight belt. The staff member was already significantly larger than me to begin with and I'd not done myself any favors by neglecting to remove the belt. Make life easier. Drop the weights first. The GOOD news is that I did improve! The training and ongoing scenarios with TRACC gave me the confidence in a rescue situation that I didn't have before. After making a mistake, THAT mistake was typically one of the first things that came to mind when another situation came up. I now have a list of things that went well or poorly and why; this is what I've started to revisit with each scenario and will continue to come back to when/if a rescue situation ever comes up. The dedication of the staff at TRACC to helping me with this course was immense! They were dragged through the water and sand (not always very gracefully), stained with fake blood (that stuff REALLY doesn't want to wash off!) and always up for finding ways to get hurt and die. From the bottom of my heart, thanks guys! TRACC seriously recommends that all divers get certified to rescue. This is why.